All Zupapa® trampolines get TÜV certified. Take Zupapa® trampoline home, take safe entertainment for your family. TÜV is German organization that works to validate the safety of products of all kinds to protect humans and the environment against hazards. As independent consultants, they examine products which require monitoring. All Zupapa® trampolines are German quality, safety assurance! Considering the safety of you and your family, we highly recommend that DO NOT buy those trampolines without TÜV certificate. You can get more information about the TÜV from Wikipedia. If your order is placed from October 1st, 2017 to March 31,2018, your warranty date will start from May 1st, 2018. That's to say, your warranty will be extended much longer time ranging from 1 to 6 months automatically. All Zupapa trampolines get TUV certified. TUV Report Reference No. for Zupapa: 70.300.13.544.01-00. 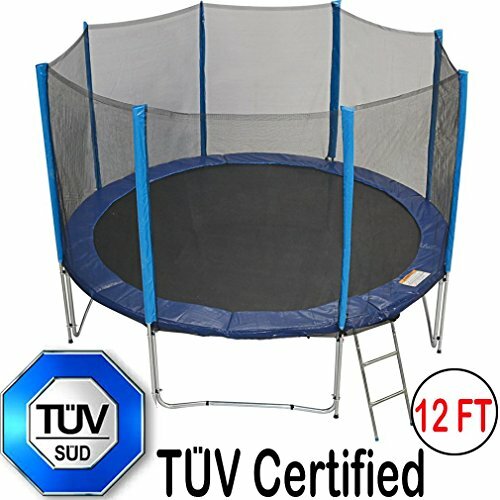 Maybe you are curious why some trampolines are declared as TUV tested, but the others are TUV certified. What's the difference? Actually, TUV certified is totally different with TUV tested, because TUV certification is a comprehensive test of the chemical composition of the material and the structure design of the product to ensure its safety. However, TUV test approval is only doing test for one part of the product, such as weight capacity. That's to say, TUV certification means totally safety, but TUV test is cheap rather than safe! If you have any questions about this product by Zupapa, contact us by completing and submitting the form below. If you are looking for a specif part number, please include it with your message.